An audio transcriber is the link between spoken words and official documents. There are many professionals in the world who talk better than they can write, and it is to you, the work-from-home transcriber, that these people turn to to make their words concrete. Professional audio transcribing is heavily relied upon in many professional fields, including corporate, legal and medical. The demand doesn't stop there. Freelance transcribers are widely desired by people needing smaller, shorter-term transcriptions, including students, writers and academics. A specialty niche of the field is Translation Transcription. 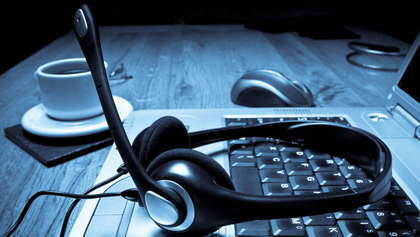 If you are bi-lingual, you can offer your transcribing service for a higher wage. There is also a demand for more than just the copying of words. Most audio transcribers offer two different classes of transcription. Verbatim transcription is arguably the simpler, where every word spoken is written down. There is also the more expensive summary report transcription, where you also work as editor, distilling and refining the main points of the you are transcribing. Transcribing is a time consuming profession. An hour of multi-speaker recording will often translate into four hours of transcription, even for an experienced typist. However, while per-word transcribers charge pennies for each word, per-hour workers can routinely charge upwards of $100 per hour of tape or footage, depending on the quality and complexity of the audio. The pay scheme that works best for you depends on your schedule and your typing ability. You may not need the most state of the art transcribing technology, but you will certainly need equipment sophisticated enough to handle a variety of recording mediums. Jobs might come through on cassettes, tapes, disks or digital files, and you will want to be prepared for all of them. Websites such as www.tvps.com and www.transcriptiongear.com offer a large selection of new and pre-owned executive communications systems, most of which can be easily installed in your own home. Most systems are expensive even when pre-owned. But, they do allow you to do your work quickly and efficiently, a must in a competitive freelance market. To become a freelance transcriber, you must find the people who need your services. Large medical clinics and law offices might already be contracted to transcription firms. But, the professor working on his dissertation or the film student needing a written copy of an interview will be looking for a freelancer. Advertising within colleges, by bulletin board, forum or newspaper, is a great way to make people aware of your service. Craigslist and other Internet classifieds are also a first stop for people needing freelance transcription. Even advertising among members of retirement communities is tapping a rising source of employment. As more children coax their parent's memoirs onto tape and video, more transcribers are needed to make hard copies of memories. There is an abundant need for audio transcribing in today's digital world. Audio transcribing is a great way to turn your listening and typing skills into a work-from-home income.